FRANCE showed glimpses of its attacking potential with a 3-1 home win against Italy in a World Cup warm-up match on Friday. Antoine Griezmann and Ousmane Dembele scored, while Kylian Mbappe was involved in centre half Samuel Umtiti's opening goal. "It really could have been a heavier defeat," France coach Didier Deschamps said. "We have the ability to play fast and create chances. If we could finish better then we'd feel more comfortable during games." Umtiti tapped home from close range after eight minutes at the Allianz Riviera stadium in the southern city of Nice, scoring when Mbappe's volley from right back Benjamin Pavard's cross hit goalkeeper Salvatore Sirigu's leg and fell kindly to him. In the 29th minute, he ignored Griezmann's call to pass and carried on sprinting into the penalty area, where he was up-ended. In a classy gesture, sections of the home crowd chanted 'Super Mario' - the song Nice fans have reserved for Balotelli in the past two seasons. He scored 33 goals in 51 league games for Nice, but his contract is up and he is expected to leave. France was most dangerous using the searing pace of its forwards on the break. Dembele went close after cutting inside two defenders and curling a shot against the crossbar. Midway through the second half, the Barcelona winger netted with a superb curling effort from the edge of the penalty area. Barcelona centre-back Samuel Umtiti grabbed the opening goal after eight minutes at the Allianz Riviera, converting a rebound from close range after Kylian Mbappe's volley was saved by Salvatore Sirigu. N'Golo Kante fired against the post from distance as Sirigu produced a fine fingertip save, but Antoine Griezmann added a second from the penalty spot following a foul on Lucas Hernandez by Rolando Mandragora. 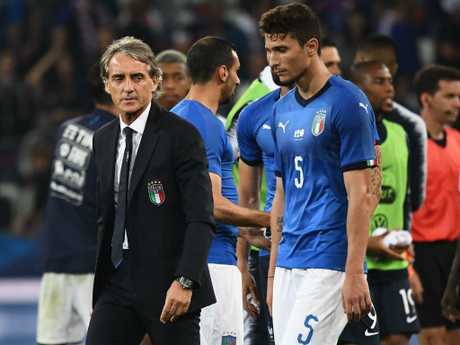 Italy cut the deficit before the break when Leonardo Bonucci alertly followed up after Hugo Lloris failed to deal with a powerful Mario Balotelli free-kick. Balotelli forced Lloris to save low with his foot within seconds of the restart after halftime, while Dembele rattled the crossbar moments later having burst past a pair of Italy defenders. But the Barcelona forward sealed victory on 63 minutes, curling a sublime first-time shot into the top corner after Mbappe's searing run was halted on the edge of the area. "There are lots of things that pleased me beyond the three goals," France coach Didier Deschamps told French television station TF1. "It could have been a bigger scoreline. If we had been more efficient we could have been at ease a bit earlier. "We're not going to get carried away, there's still a second part of our preparation ahead of us."